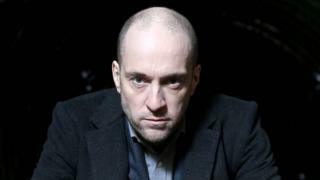 A programme in which illusionist Derren Brown suffocated himself as part of a trick has broken broadcasting rules. Something Wicked this Way Comes, shown on a Sunday morning, featured the illusionist putting a plastic bag over his head and walking on broken glass. Broadcasting watchdog Ofcom said children could have imitated Brown's "clearly dangerous behaviour". It received five complaints about the show, which aired on UKTV's Watch channel on 6 December. UKTV said the programme was broadcast in error and was unsuitable for a pre-watershed transmission. In the 14-minute segment, Brown had sought to demonstrate a technique to limit pain and bleeding. He placed a transparent bag over his head and sealed it while a member of the audience tapped out his pulse rate on a drum. Once his pulse rate had slowed to a stop, Brown - who appeared to be in a state of semi-consciousness - removed the bag from his head and walked barefoot on a path of broken glass. At the end of the sequence, the camera zoomed on his feet to show that they had not bled as a result of contact with the glass. Ofcom said: "Plastic bags are a common household item that children frequently have access to without parental supervision. They also present a widely acknowledged risk of harm to young children. "Therefore, Ofcom took the view that Derren Brown's use of a plastic bag to asphyxiate himself was likely to be easily imitable by children in a manner that was harmful. "This was particularly because self-asphyxiation was presented as a way to carry out acts which would not normally be possible because of the bleeding and pain that resulted. "Further in this programme no negative consequences of self-asphyxiation were identified." Ofcom also found that Brown's use of swear words during the segment breached the code on offensive language before the watershed. UKTV said an internal investigation had revealed that "due to human error" the programme was "erroneously labelled" as being suitable for broadcast before the watershed. It said it had implemented additional safeguards to prevent the same mistake happening again.